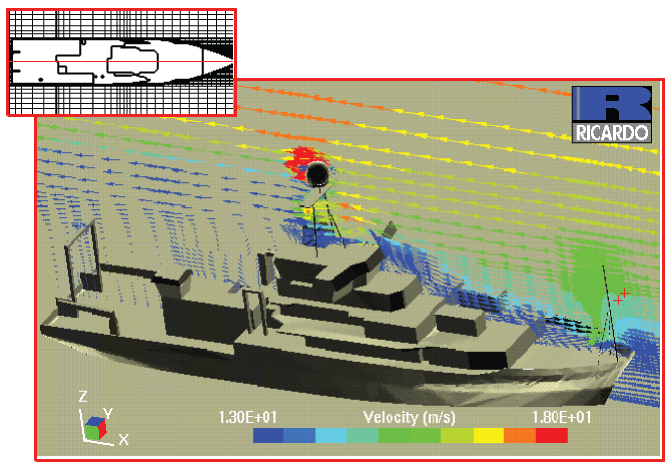 Wind speed measurements obtained from ships are subject to systematic errors. 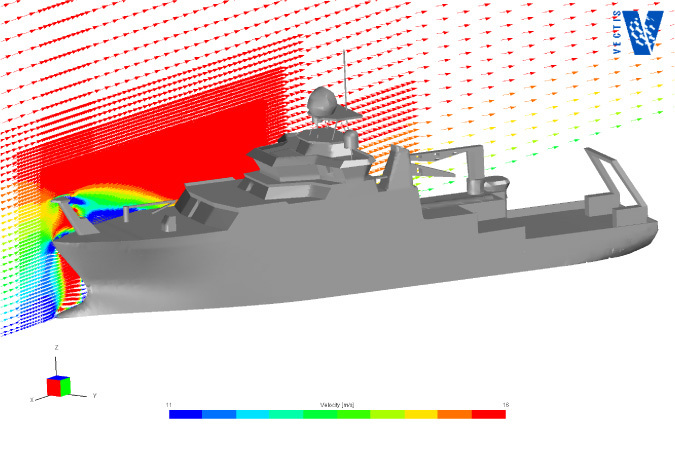 These errors are caused by the distortion of the air flow around the ships hull and superstructure, an effect which is well known qualitatively. 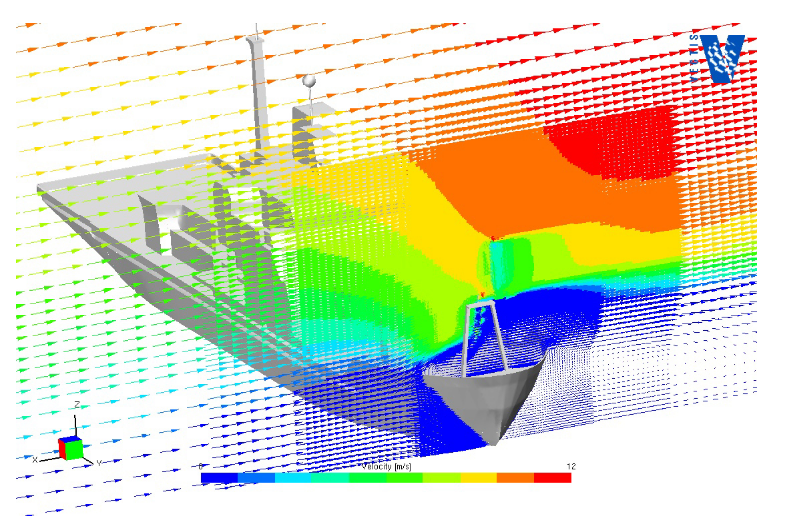 The effects of flow distortion can be significant even in the case of anemometers located in well exposed sites on research ships. 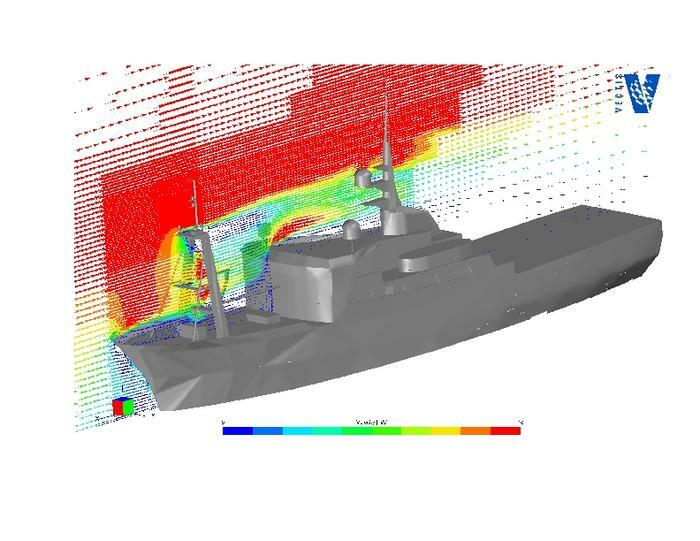 It is therefore necessary to correct such ship based measurements for these effects if accurate wind speed or surface flux estimates are to be obtained. 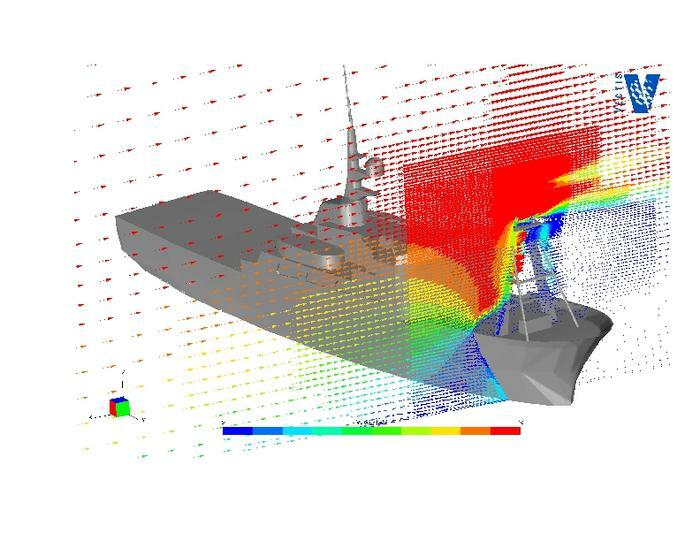 The Computational Fluid Dynamics (CFD) code VECTIS by Ricardo Software was used to simulate the airflow over a number of research ships. The simulations were solved using computational grids of up to 3 million cells. 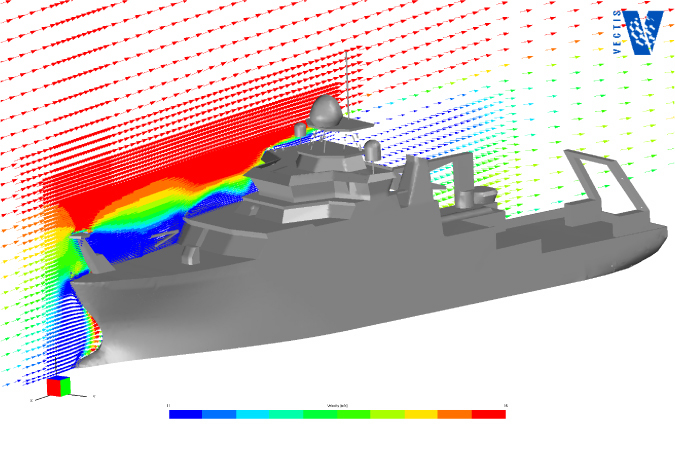 Results from various ship models are shown below. 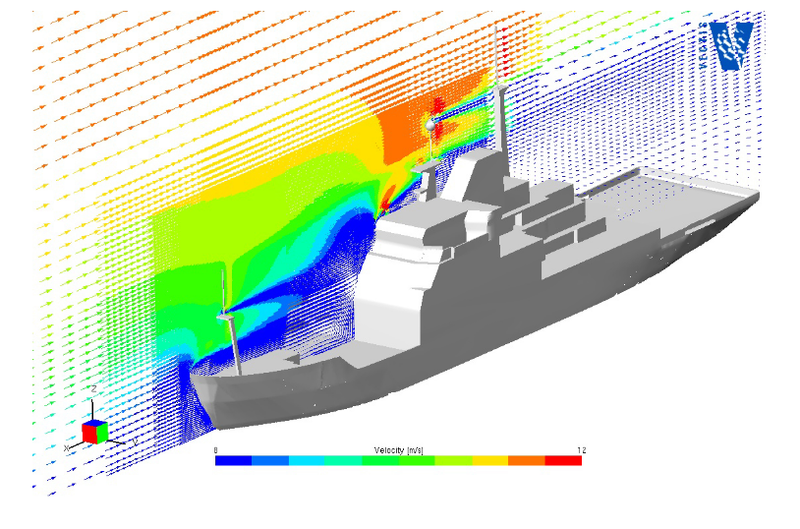 Funding has been obtained to model the airflow over the Swedish ice breaker Oden, as part of the ACSE - Arctic Cloud Surface response Experiment (NERC grant: NE/K011820/1). This will be undertaken during 2014/2015. 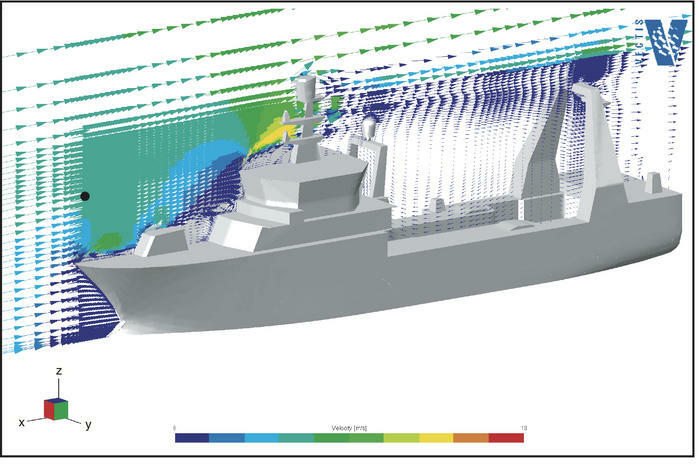 Achtert, P., Brooks, I. M., Brooks, B. J., Moat, B. I., Prytherch, J., Persson, P. O. G., and Tjernström, M, 2015: Measurement of wind profiles by motion-stabilised ship-borne Doppler lidar, Atmos. Meas. Tech., 8, 4993-5007, doi:10.5194/amt-8-4993-2015. Wind speed corrections due to airflow distortion have been produced for instrumentation mounted on the RRS James Clark Ross during the WAGES project (NERC grant: NE/G00353X/1). Yelland, M. J. 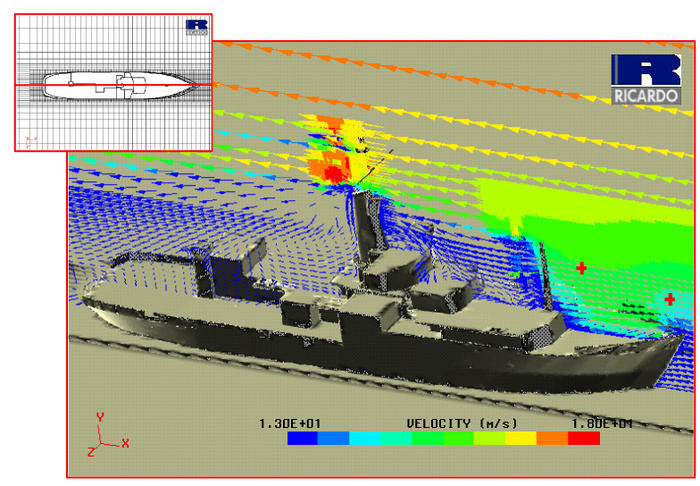 B. I. Moat, R. W. Pascal, and D. I. Berry, 2002: CFD model estimates of the airflow over research ships and the impact on momentum flux measurements, J. of Atmos. and Ocean. Tech., 19(10), 1477-1499. 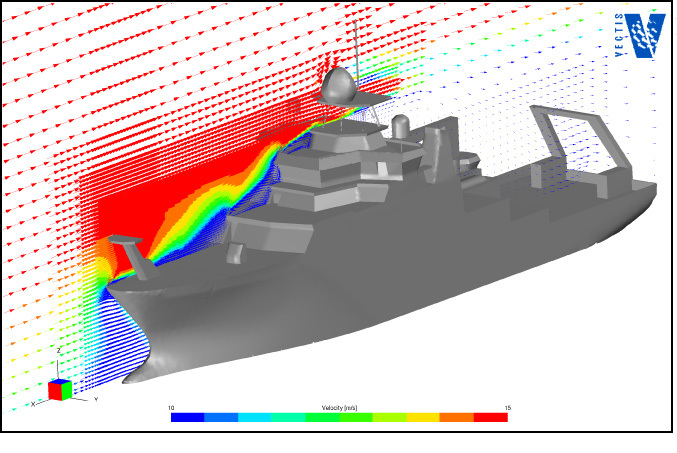 Computational Fluid Dynamics (CFD) modelling was used to study the flow of air over the Polarfront to determine the wind speed bias at the anemomter locations. This UK-SOLAS project (HiWASE) was funded by the Natural Environment Research Council (grant number NE/C001826/1). Yelland, M.J., Pascal, R.W., Taylor, P.K. and Moat, B.I., 2009: AutoFlux: an autonomous system for the direct measurement of the air-sea fluxes of CO2, heat and momentum. Journal of Operational Oceanography, 2, (1), 15-23. The Natural Enviroment Research Council (NERC) took delivery of the research ship the RRS James Cook in August 2006. Fig. 4: A comparison of the wind speed bias at anemometer locations on the foremast of the RRS Discovery, RRS Charles Darwin and RRS James Cook (Moat and Yelland, 2008). This project was funded by the National Oceanography Centre Technology Innovation Fund (TIF). 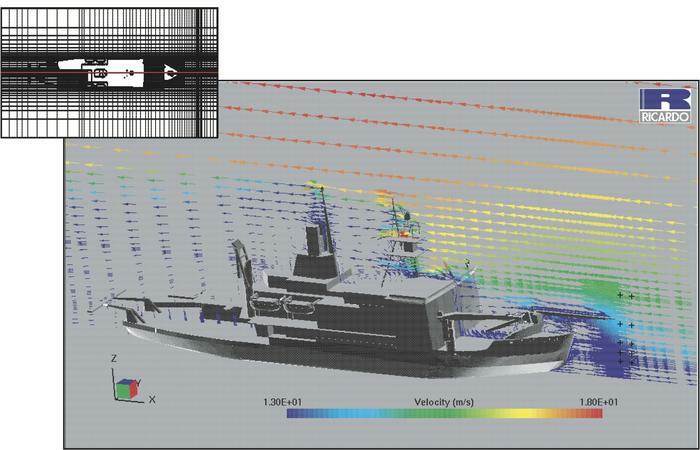 Moat, B. I. and M. J. Yelland, 2008: Going with the flow: state of the art marine meteorological measurements on the new NERC research vessel, Weather, 63(6), 158-159.
Corrections for instruments on the NOAA ship RV Ron Brown, WHOI ship RV Knorr, the AWI ship Polarstern and the NIWA vessel RV Tangaroa have been calcualted. Berry, D. I., B. I. Moat and M. J. Yelland, 2001: The Air Flow distortion at anemometer sites on the FS Polarstern, SOC Internal Document 69, National Oceanography Centre, Southampton, UK. 26pp. Yelland, M.J., Moat, B.I. ; Pascal, R.W. 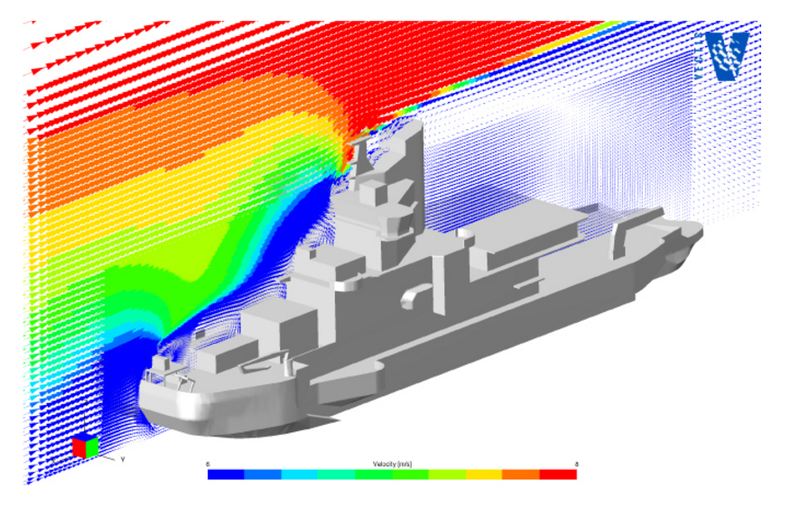 ; Berry, D.I.. 2002 CFD model estimates of the airflow distortion over research ships and the impact on momentum flux measurements. Journal of Atmospheric and Oceanic Technology, 19 (10). 1477-1499. Yelland, M.J., Moat, B.I., Taylor, P.K., Pascal, R.W. ; Hutchings, J., Cornell, V.C.. 1998 Wind stress measurements from the open ocean corrected for air flow distortion by the ship. Journal of Physical Oceanography, 28 (7). 1511-1526.